The coat of arms of the town is a golden, (yellow), six spoke wheel on a shield of Late-Gothic form. In this big coat of arms is a head of Pantokratos, in upper parts alfa and omega, in the midpoint the moon and the sun, in lower parts letters r a t. Over the coat of arms is situated a crown. The first written mention of the town originates from a pergamen of the Ostrihom archbishop John from the year 1211 about donation of local church revenues for the Ostrihom canonry. Trnava is situated in the centre of the Trnavská downs 45 km to the north-east of the capital of Slovakia – Bratislava, 146m above sea level. The terrier of Trnava is spread in a warm climate. The average annual air temperature is about 9 – 10 degrees Celsius. The average annual rainfall is 560 mm. 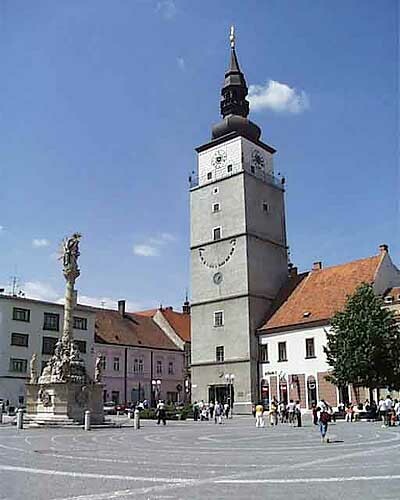 Trnava – the first free Royal Town in the Slovak Republic. The Hungarian king Belo IV.th awarded Trnava privileges in the year 1238. A rich history of the town left some marks in an amount of culture-historical sights and thanks to these monuments Trnava belongs to the jewels of Slovakia. Trnava is characteristic of its fortification system, of its complex of Baroque university buildings and mainly of an amount of church sights. There are 11 churchs in the town. No wonder then the town got a name The Smaller Rome.